Well hello to you my reader chums! I began the series 'Inspirational living' a while back, where whenever I saw a quote I was inspired by or felt passionate about an issue, I would express my thoughts in one of these posts and hopefully share some positivity with my readers. I've previously done blogs on body confidence tips, being positive and today I've chosen to talk about kindness. As we're in the festive season surrounded by love, laughter and cheer I thought it was the perfect time to spread that extra bit of warmth amongst us all. Kindness is one thing in life that is completely and utterly free, yet an act which makes us all feel truly special. 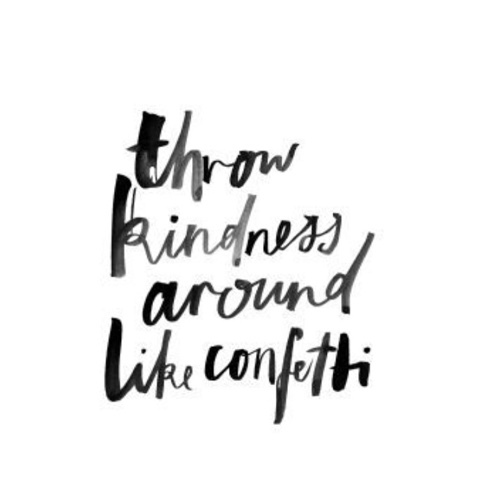 Whether it's smiling to somebody on the street, opening a door for someone, helping carrying shopping or giving a compliment, kindness I think is a gesture which we should all share. It's an act that causes no harm and can make the individuals day. Especially since we're in the season of giving, there's no better time to do something for the community or within your circle of loved ones. Compliment someone - This is something I love to do a lot. Whether it's telling a friend, family member, work colleague or stranger their outfit, hair/ makeup looks fab today or simply describing your favourite attribute about them, those kind words are guaranteed to bring a smile to their face. Writing a loving message - Either over text, letter, email or whatever method you'd like to use, telling someone how much they mean to you and the amount of care you have for them will truly make that friend or family member feel loved. Sending a cute card - I've done this recently with one of my best friends as she was going through a hard time. You can find quirky, blank cards in a series of shops with inspiring quotes on the front or funny images, perfect to send and make someones day. The message you write is then up to you, although even if words aren't your thing, the gesture and love is still there. Leave a kind message by the mirror - This could be in your own home or public bathroom. The idea being to use a post it note or piece of paper and write something along the lines of 'you look beautiful today', which you'll then stick up by a mirror for a visitor to read when she/he is washing their hands. Post it notes are probably the best way to do it as that way you're not likely to get in trouble and visitors can still appreciate that act of kindness. Putting a note on a park bench or local library - I saw something like this in one of SprinkleofGlitter's videos on the same subject. I love the concept of writing a loving note to a complete stranger and knowing you'll bring light to somebody's day. Whether you choose to put it together in letter form in a envelope on a park bench in your local park ( then watch from afar who finds it) or a smaller sweet note in a book in the library is up to you. Either way, it's that surprise which will bring happiness to the recipient of your love. Making a care package - For a loved one who is going through a rough patch or is currently a bit under the weather, a care package can go a long way. You can fill it with their favourite sweet treats and some pamper bits for instance so that family member or friend can have the opportunity to relax and enjoy those yummy items. Visiting a local care home - If you'd like to be apart of your local community and help out, care homes nearby are filled with residents who'd love a visitor to chat to and share their many tales with. Or if you have spare time on your hands, see if you're able to volunteer there on a regular basis, to offer that extra set of hands. Give clothes to charity - Every so often, I have a good wardrobe clear out and give all the items I no longer use to charity. These clothes they're able to sell on in the shops to make money for that organisation, benefiting those in need. These are just a few ideas I've come up with which I absolutely adore, some of which I do quite regularly. I think being kind is such a simple yet meaningful thing many of us forget with our everyday life, but taking the time to do these little acts can really inject some love back into the community and bring a smile to everyones face. I hope you enjoyed this random acts of kindness post. What sort of ways do you spread kindness? There are so lovely ideas here! You're so kind! It is a great idea Della. I think if all men follow these steps there will be no discrimination. Respect. This is such a lovely blogpost to read! I love your ideas! Such small ways that would make such a big impact on somebody life!